I have some severely mixed feelings on this. 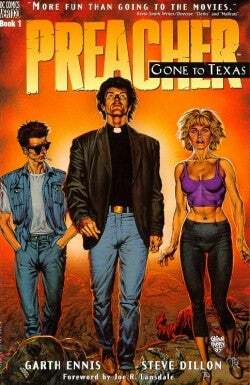 Preacher was a very influential work for me in my college years, and helped form many of my beliefs on religion, society and personal responsibility. I haven't read the series in years, but I still know all of it by heart. I'll be watching it's development with a very critical eye, and it's not like Rogen has a great track record when it comes to treating adaptations with the respect they deserve. I am heartened by the news that both Ennis and Dillon are onboard with this project, and thus far feel positive about it. Then again, Frank Darabont was head honcho on Walking Dead, and that didn't exactly turn out well according to most fans of the original comic, including me. Frankly I'm worried they'll change ages, genders and backgrounds just to try to make the show more well rounded, or worse, just to intentionally distance it from the source material. I'd love to get some thoughts from other Preacher fans out there.